Why were there so many people on a Tuesday? Because kids are out of school? 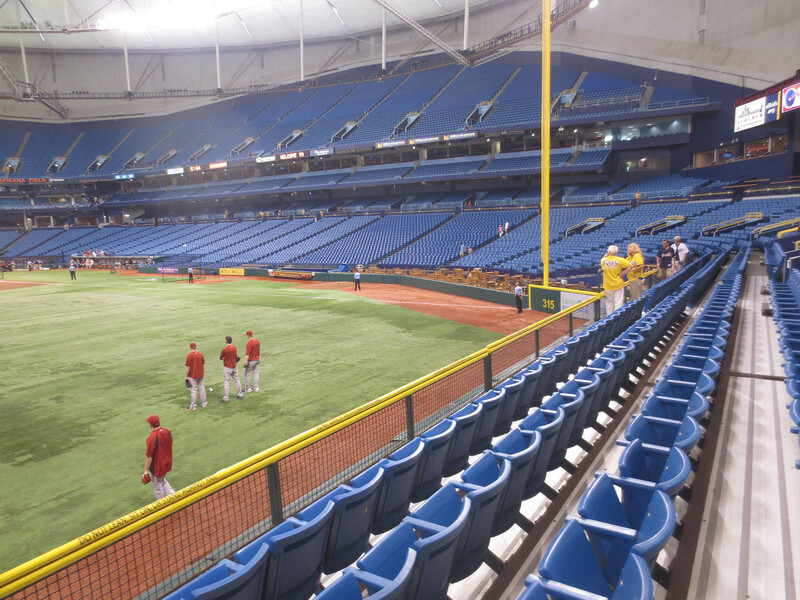 Because the Rays recently moved into first place, and this was their first home game after the All-Star break? 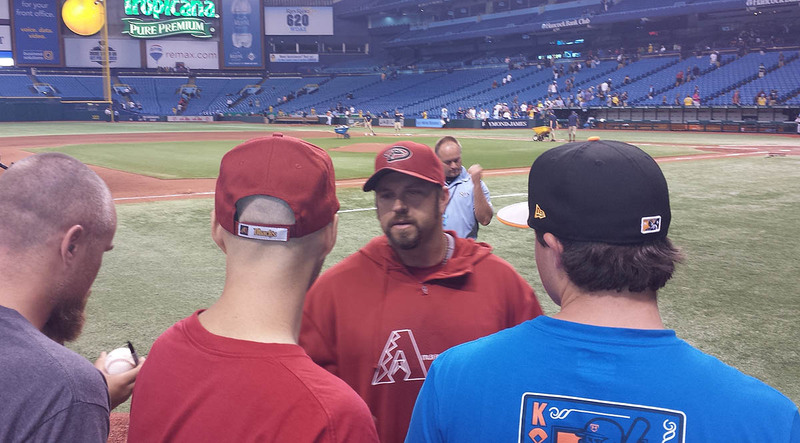 Because everyone else wanted to see Heath Bell too? Have you ever seen anything like that?! Michael said he snagged it during batting practice earlier this season, and he made a good point: the double-logo can’t be the result of another ball hitting it because then there’d be a mirror image. Somehow, this fantastic defect must have occurred during the stamping process at the Rawlings factory in Costa Rica. As you can see in the photo above, the lines went all the way back past the bag check area and into the parking lot. 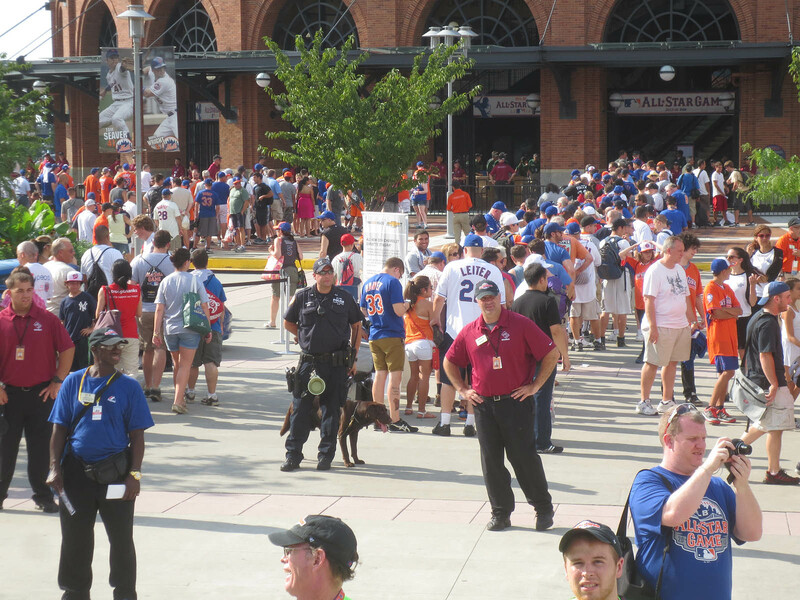 I can’t believe I’m saying this, but the lines were longer here (for a regular-season weeknight game) than at Citi Field for the Home Run Derby. I don’t get it, but hey, good for the Rays. 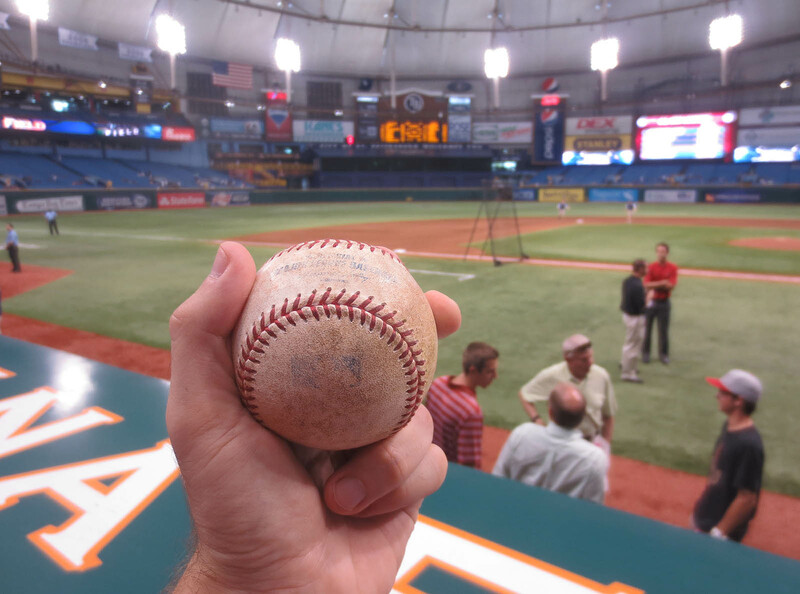 During that brief window of time, I got J. J. Putz to throw me a ball. In the photo above, do you see the guy crouching in the front row? That’s a friend of mine named Andy — more on him in a bit. 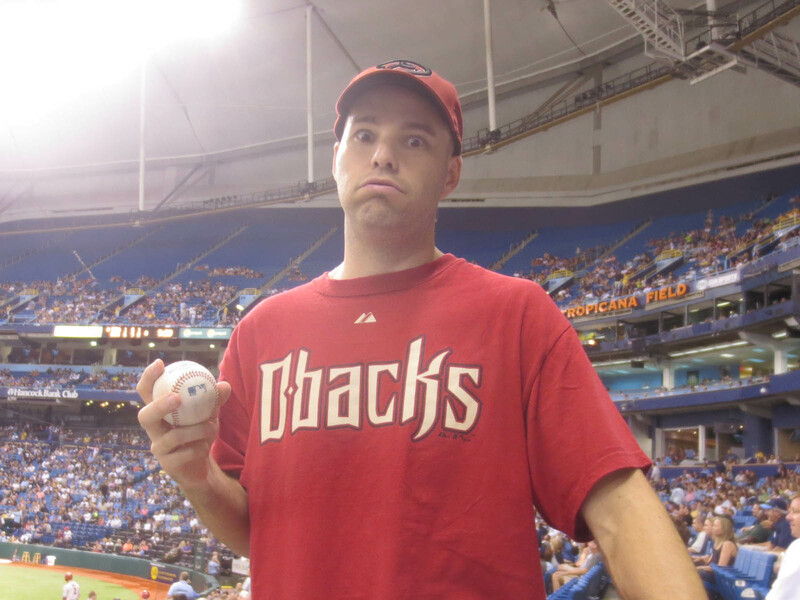 Ten minutes into BP, I got a ball tossed by Brad Ziegler (which I handed to the nearest kid), and soon after that, I got another toss-up from Brandon McCarthy. 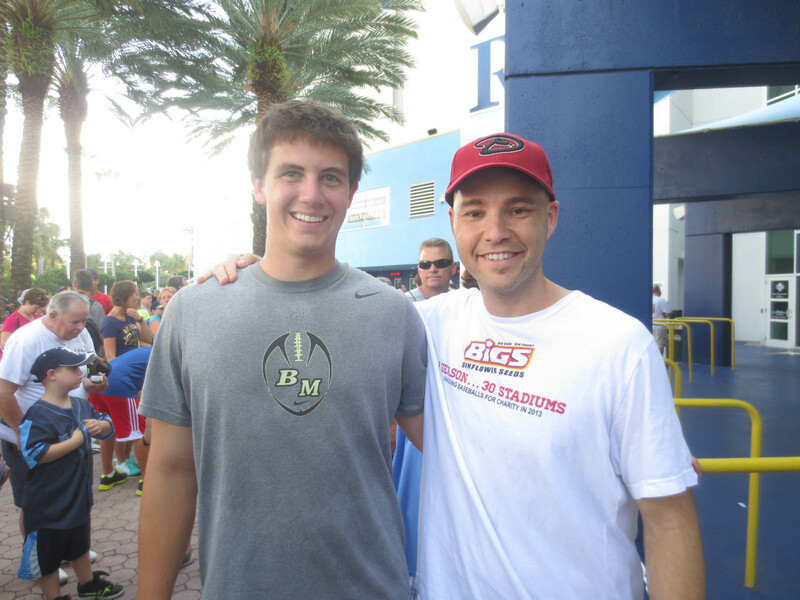 In the photo above, do you see the kid in the gray cap on the right? 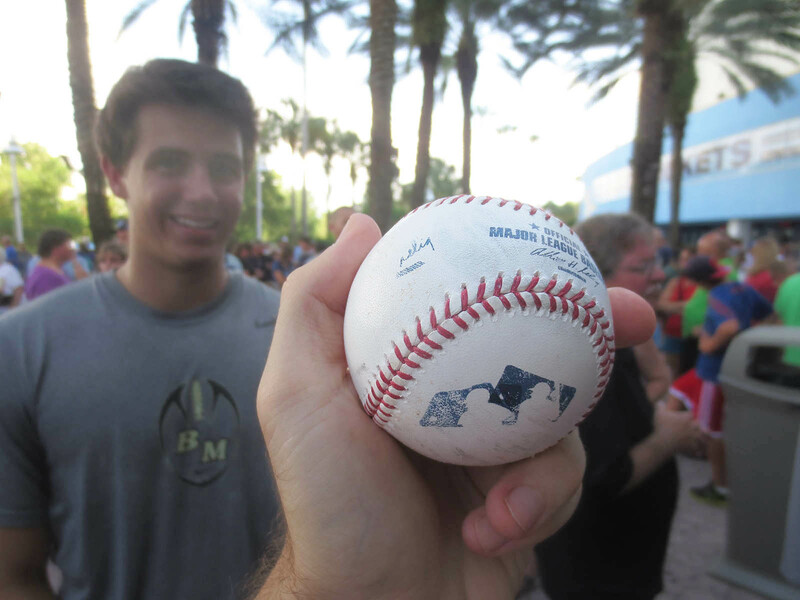 He’s the one who tossed it to me, and yes, I decided to count it in my collection. 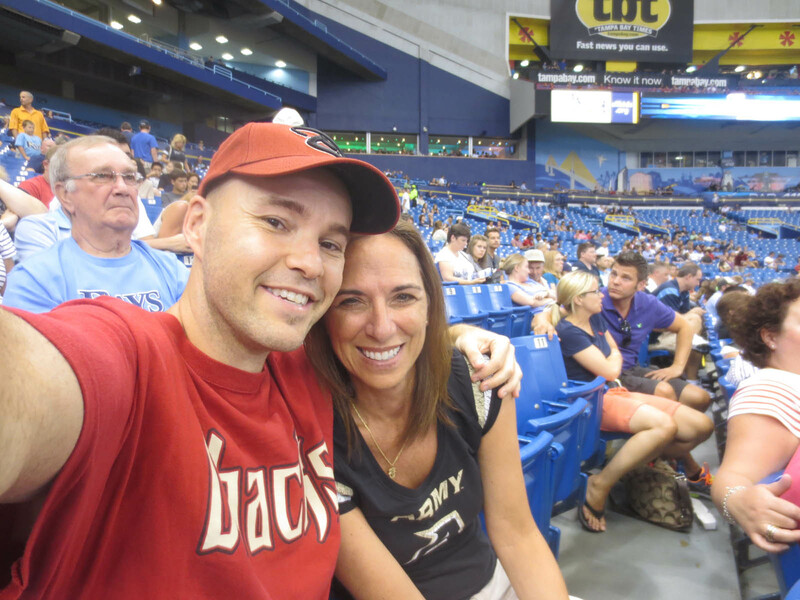 I asked him if he was connected to the Diamondbacks in any way, and he told me that his father works for the team. I resisted the urge to ask who his father is, but later on I saw him sitting next to Derrick Hall in the front row behind the dugout. Pretty cool. I spent the next half-hour with Andy, Eve, and Michael . . . and Michael’s father Paul — a great bunch of folks. 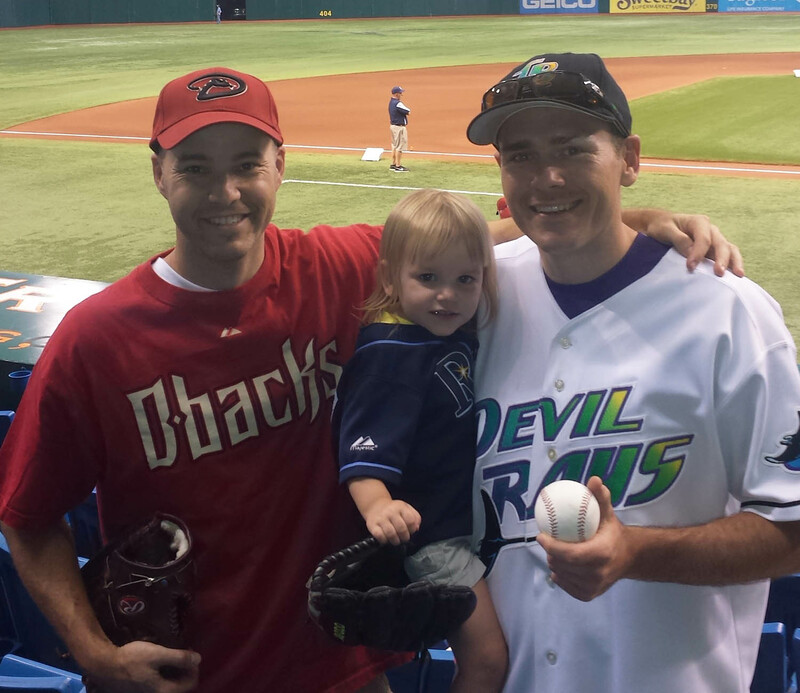 I feel lucky to have gotten to know so many nice people in various baseball cities. For righties, I moved here . . .
Here’s something random for you . 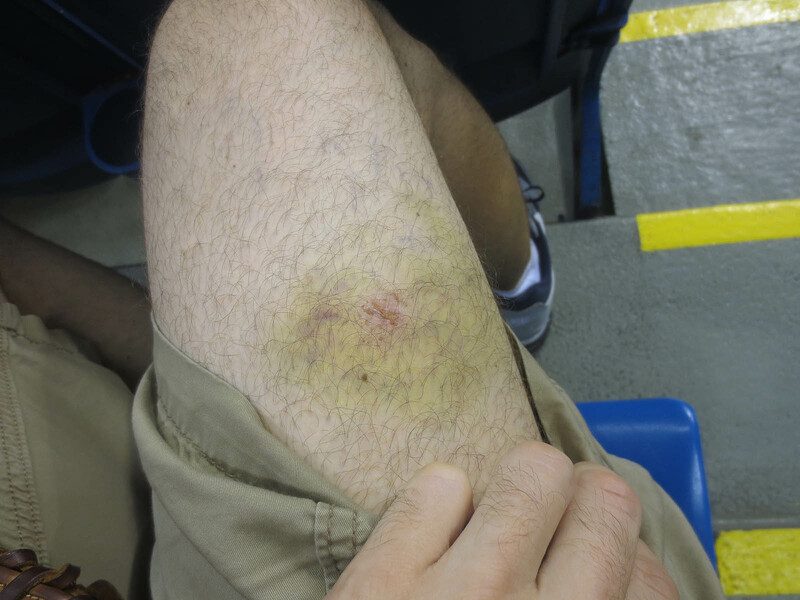 . .
Running full-speed into metal armrests isn’t fun. Early in the game, in between batters, I heard some thunder that was so loud and perfect that I wondered if it was a stadium sound effect. Then I heard it again during an at-bat and realized that there was, indeed, a powerful storm in the area. In the bottom of the 2nd inning, the lights flickered and then dimmed slightly, and I knew right away that the game was going to be delayed. The only question was . . . how long would it last? 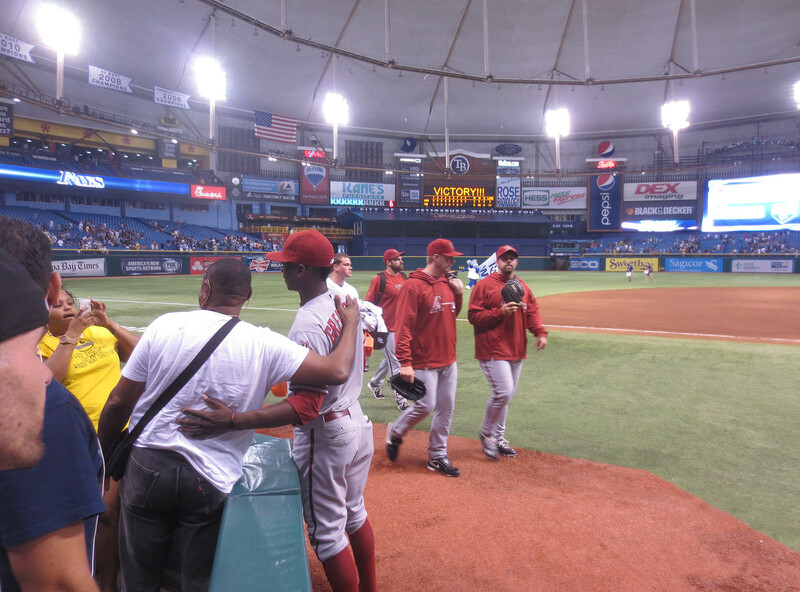 I said a quick hello as he walked past, and we made a plan to meet near the dugout after the final out. 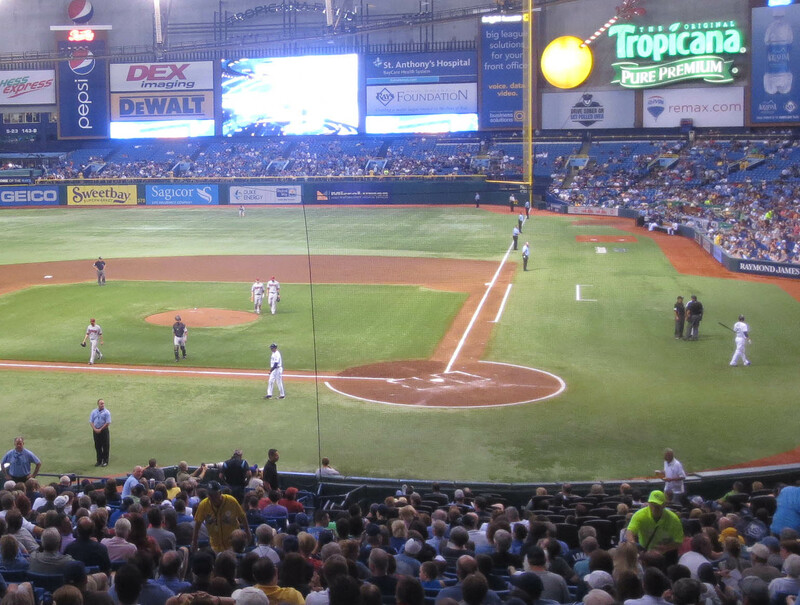 The Rays ended up winning, 5-2, behind a 102-pitch, complete-game effort by “Fausberto,” as Andy calls him. Our conversation didn’t last long. Mainly, I wanted to let him know that I’ll be at Chase Field on August 12th and 13th, speaking of which . . . I now have three more stadium visits planned. I’ll be at Dodger Stadium on August 9th and 11th (and maybe also on the 10th, which is a Saturday afternoon Hideo Nomo Bobblehead giveaway, so I’m tempted to skip it and relax). Then I’ll be heading to Chase Field, and after that, I’ll be in Oakland for two games on August 14th and 15th. Given my challenge from the folks at BIGS to snag a gamer at each stadium, it’s much better when I can be at a place for more than one day. Many thanks to BIGS for making all of this happen. Visiting these stadiums never gets old, and even though I sometimes complain, I’m constantly grateful. Goodbye, Florida. I won’t miss you. • 406 balls in 54 games this season = 7.52 balls per game. 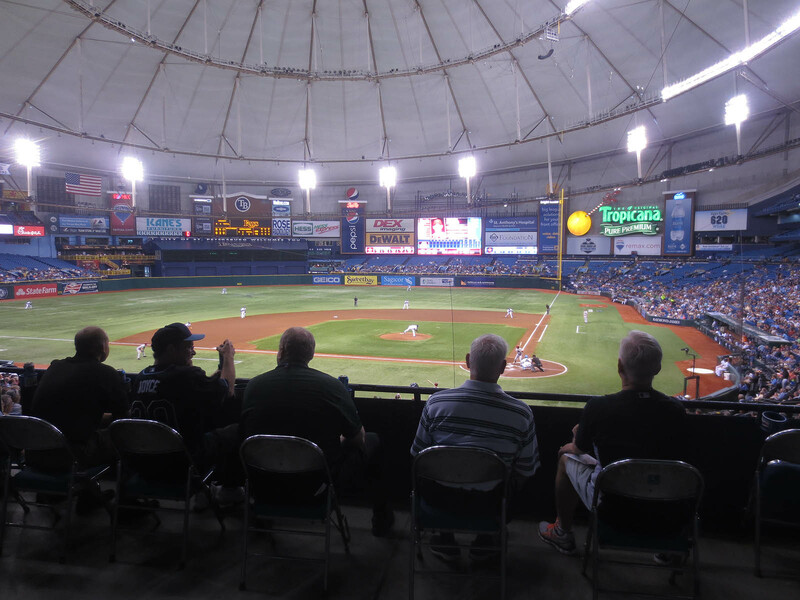 • 29 balls at 4 lifetime games at Tropicana Field = 7.25 balls per game. I will see you in Phoenix on 8/13! 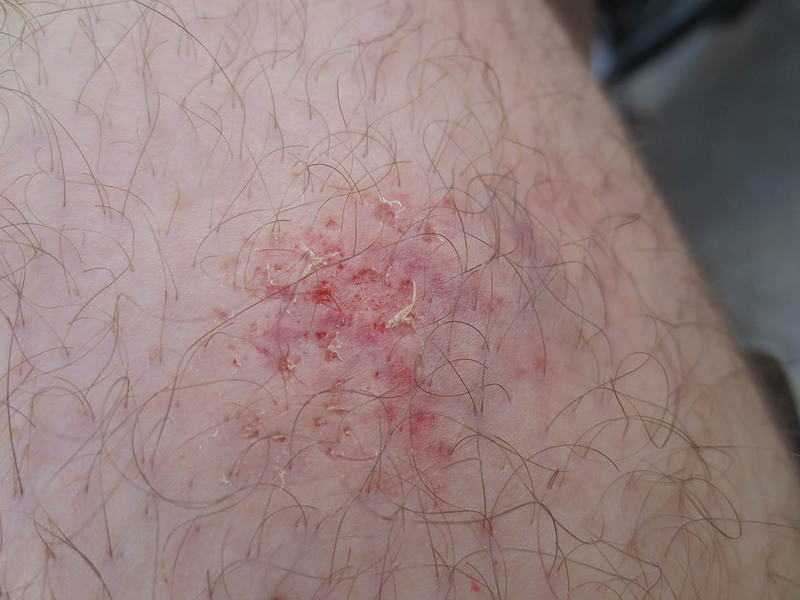 You might wanna get ur “injury” checked out. it might be serious cause of the discoloration. Anyway, u made a great effort for that 3rd out ball. Im impressed. Good job on the gamer. 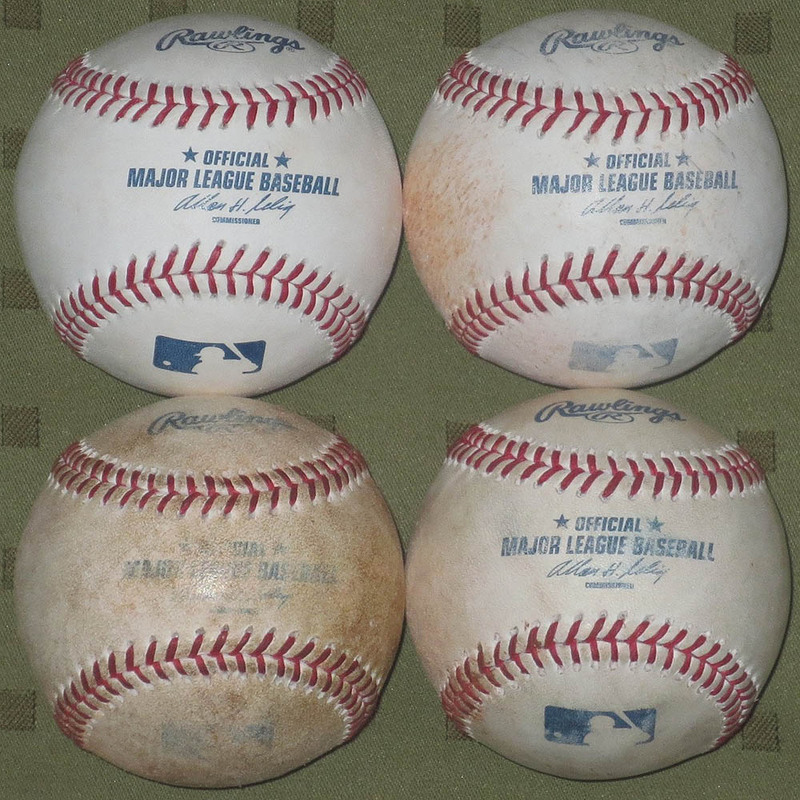 Quick question though who on the Cincinnati reds is good about giving baseballs out. Good luck on the west coast. Good job Zack! I almost see you at Atlanta(I’m going to be there on August 9-10). Guess i’ll have to go to New York to see you(You have to sign your 3 books that I have from you). Good luck for the 8 remaining stadiums! Was michael’s stamped as a “practice” ball? 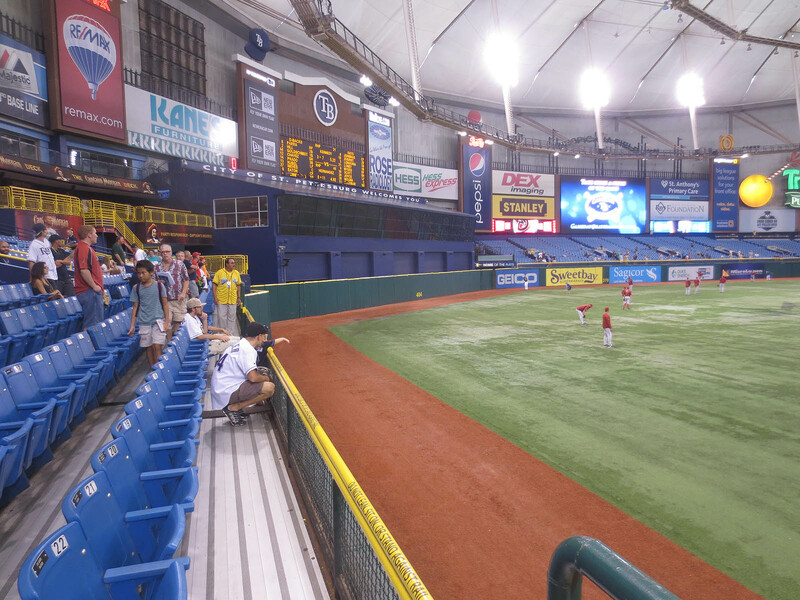 Do they still have that joke of a rule where you’re not allowed in the 1st row of the outfield sections during BP? 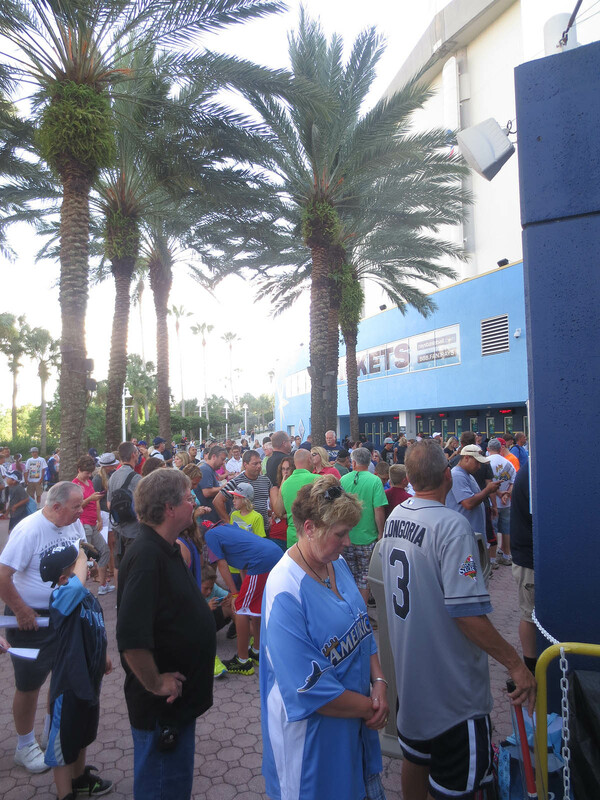 You think that trying to get into the Trop was bad. How did you go trying to get home after ? When we saw a series against the damn Yankees , the job of getting to the bus after the game can only be described as a nightmare. Anyway , good to see the fans showing up ( finally ). 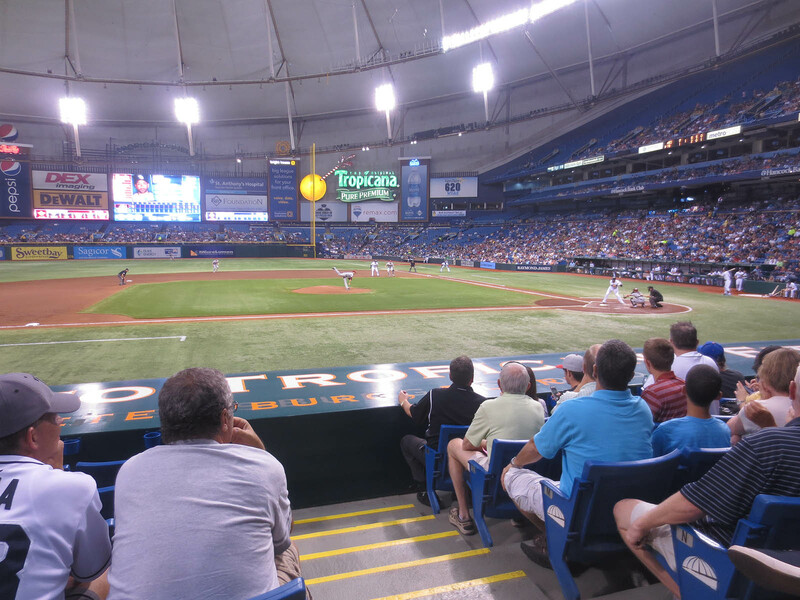 Go Rays !!! 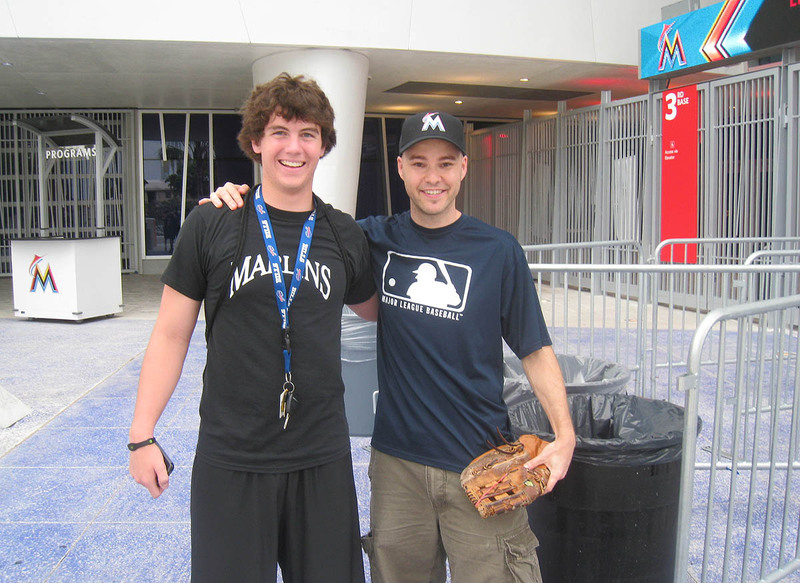 I went to The Trop over a winter break a few years ago and asked for a tour. They thought I was insane. ( which can be argued) Everywhere else I’ve gone you can get a tour, anytime during the year, and they are happy to do it. 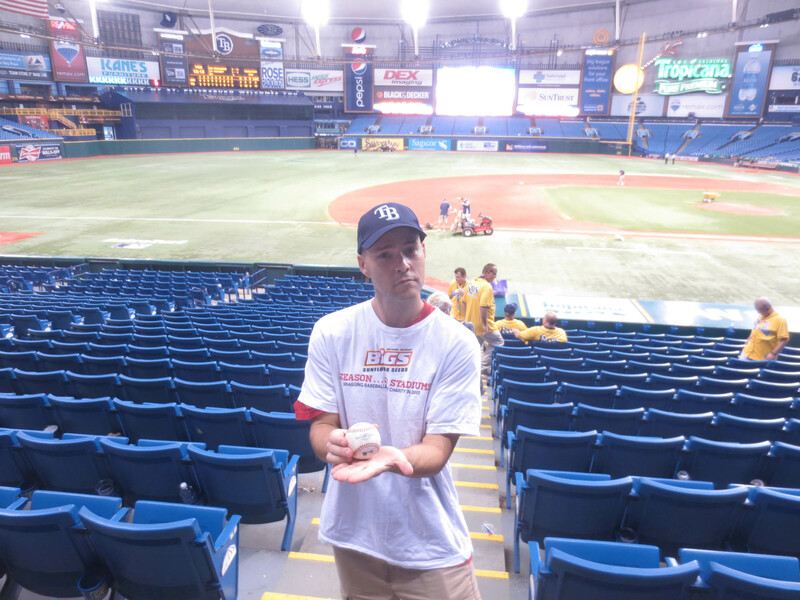 The guys running the Rays know very little about customer satisfaction, in my opinion. 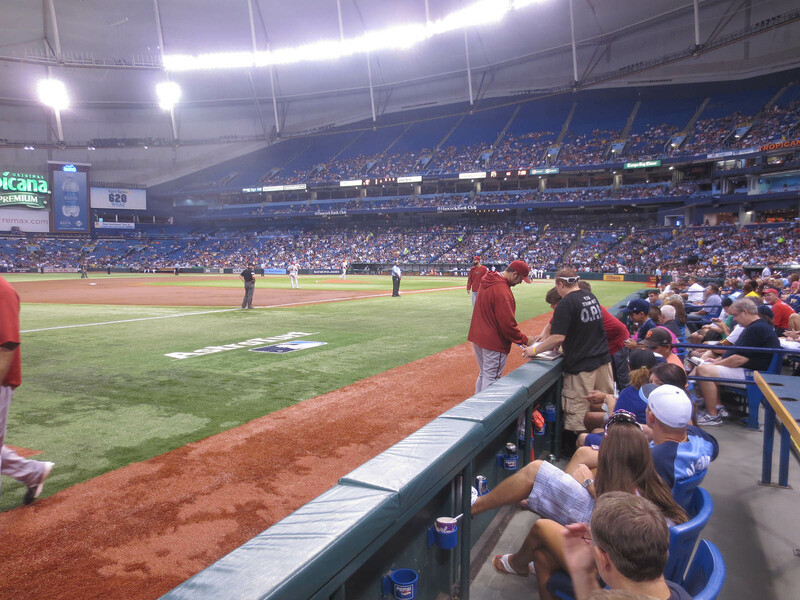 Last time I went to the Trop and did BP this season they were still enforcing the “no front row” rule. I’m sorry you didn’t snag your usual numbers, but at least it confirmed to me that it is indeed a bad park for hawking. And the ever-escalating prices added to the drive time for me from Orlando cuts down on my inclination to go there more than a few times a season. Especially with Spring Training and the far-more-economical minor league and college summer league teams in the state. I’m looking forward to seeing you in Oakland this year! I’ll be there on the 14th, but not the 15th, it looks like. The Coliseum has been tough this year, its been more crowded than I expected, but hey, the A’s are the 5th best team in Major League Baseball! I don’t know if you heard, but for the rest of the season, the A’s are opening the gates 2.5 hours early on Fridays only. Other times are still the same. Now, A’s fans actually get to see their team take BP. Of course, there are only 5 more times that it will take place. They did this all because Yoenis Cespedes won the HR Derby. So… for Yoenis Cespedes bobblehead day, on August 17th, the gates will open THREE AND A HALF HOURS EARLY. Yes. 2:30pm for a 6pm game. Thanks very much for the comments. I read them all, but don’t have time to respond now. I need to hurry off to Turner Field. More later . . . 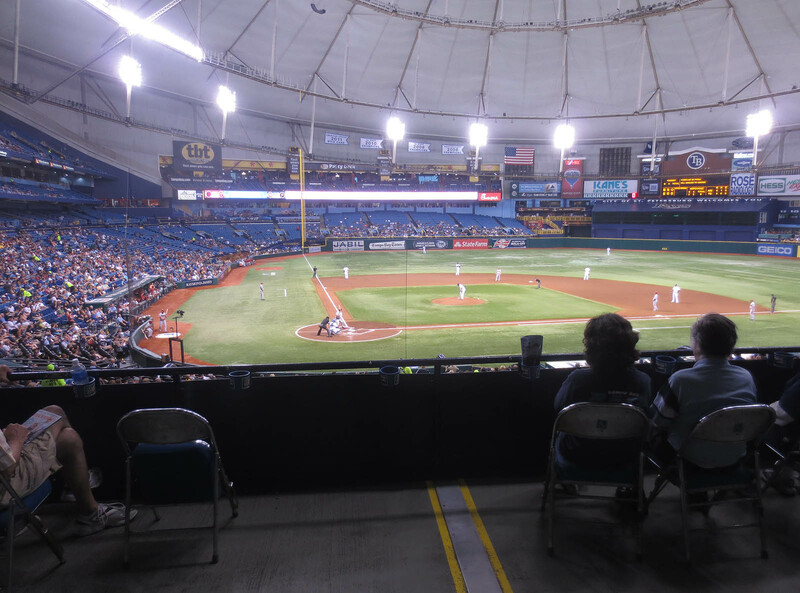 I hated my visit to Tropicana Field earlier this year as well. The security and ushers were applying rules that shouldn’t have been there. Good luck the rest of this season, though! Thanks. My eye seems to be okay, but it’s still ugly as hell. Which game? I was at Citi on August 2nd. That’s not a quick question because I had to go look at the roster. Mat Latos is the worst. Sam LeCure is the best. Sorry to miss you. Hope to see you in NYC, and of course I’d be delighted to sign your books. Yeah, it did have the “practice” stamp. No, unfortunately I won’t be there, but I hope we can catch up some other time. It’s not a fun area. After a few minutes of waiting/confusion, I was able to find an electric “green” taxi with a top speed of 20 miles per hour to drive me back to my hotel. That’s funny and lame. Jeez. Very interesting to hear that. I suspect you speak for a LOT of fans. 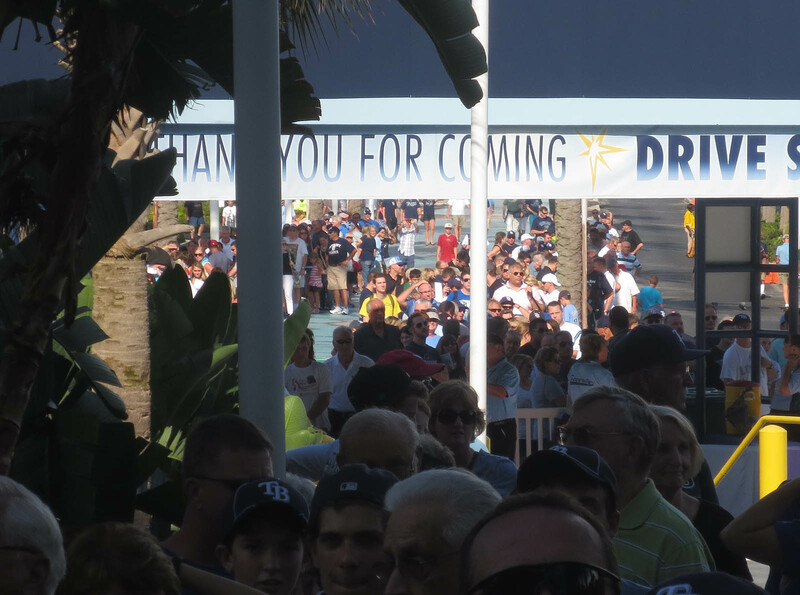 The Rays could/should do a lot more to entice folks to show up. Just read it. You’re goooood. Really. Thanks. Well, dang. Now I wish I were gonna be there on a Friday, but silly me, I decided to avoid that day because I figured it would be crowded. Anyway, see you soon! Sorry you had a crappy time there, but I’m glad that we at least agree. It’s definitely tough, but somehow I’m still able to pull it off. Thanks for your weighty advice. I do intend/hope to stay thin. I’ve only been to 1 Friday game this year, and it was against the Rangers this past week. 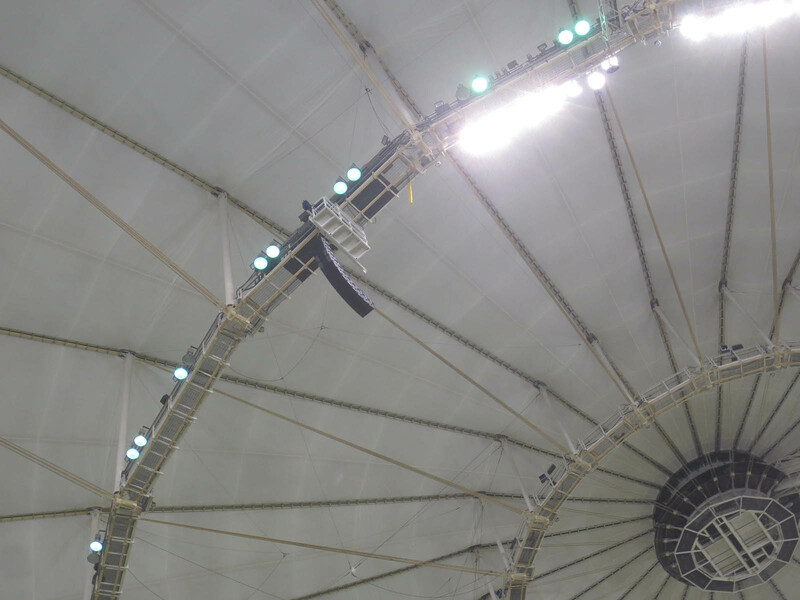 It was the first time I ever got to see A’s BP in it’s entirety and I was not impressed. The Rangers didn’t hit much out either. If you are able to I would recommend extending your trip in Oakland by a day, so you can get in the Friday game vs the Indians. From what I’ve personally seen, plus what I’ve heard from others, the crowds have been very manageable, so knowing you, it could wind up being great for you!